Through-the- wall air conditioners offers a great energy-efficient and space-saving cooling system. These self-contained units fit through your wall. They are styled like a window AC unit but a hole is actually placed in the wall for them so you don’t lose your window, the chance to open it, and the opportunity for a great view. These units are supported by wall sleeves. The best part is that the heat is emitted from the exterior of the wall, so it doesn’t negatively impact the temperature of the room. Through-the-wall units are a permanent cooling option for homes. They are designed to meet the cooling needs of a given room space. Through-the-wall and window air conditioners are very similar. But, they have some differences that make people choose one over the other. Window units are, of course, installed in the windows. But typically, air conditioners are not built to fit any particular window. Further customizations have to added to avoid seepage after installation. Window air conditioners typically vent out the heat from the sides and the back. Through-the-wall units only vent from the back, helping to lower the amount of warm air that makes its way back into your room. Window units are preferred by those who like to be able to put the unit away when not in use. These units are kept in action during summers and stored in winters. But, for those who do not want to meddle with the AC unit and prefer a permanent solution, it’s a good choice to install a through-the-wall AC unit. If you choose to purchase a window air-conditioner, then you need to be sure that the window measurement complements the AC unit. When you install a through-the-wall unit, you can just have the hole cut to your needs. While a through-the-wall unit can be slid out, it may not always be necessary. So you have a hole in the wall but you don’t have to move the AC annually. Window units are easier to install and uninstall and don’t leave a lasting mark on your house. But here, it’s an issue of a one-time installation versus an annual process of setting up and removing a window unit. Both types of unit stay pretty much out of the way. Through-the-wall units also allow you to keep your windows as it is. They can pretty much be placed anywhere on the wall. If you need to cool a small room, then you can do away with window units in less than $200. 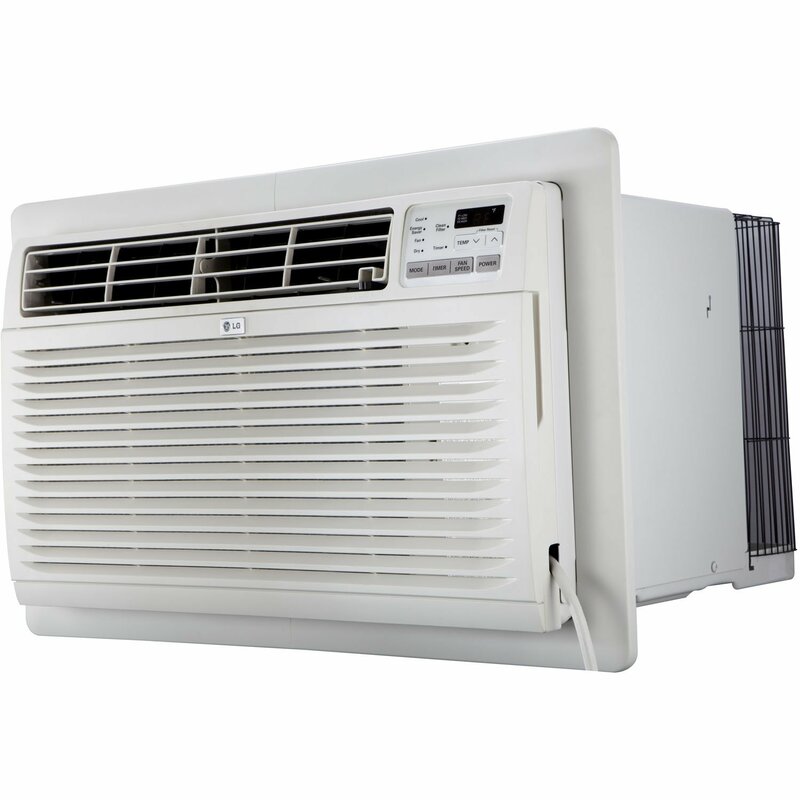 Both types of air conditioners come in much larger capacities, too, of course. A notable difference is that through-the-wall units are more energy-efficient than window units. 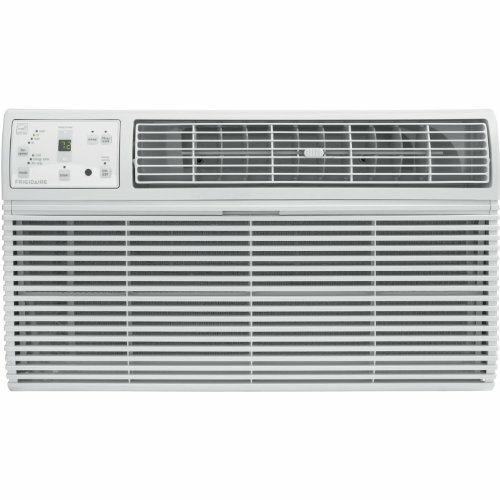 Window air conditioners are cheaper than through-the-wall ACs. So you’re looking at the difference between up-front savings and long-term savings. That will make through-the-wall units more effective in the long term - as long as you have the initial budget to pay for it. Check carefully that you’re not going to be interfering with existing pipes or wiring. Take into consideration the wall thickness. Be sure that you are choosing the right wall in the room. For that, you probably want an HVAC professional, not just a carpenter. These ACs need to be vented so be certain it’s an exterior wall. Once the wall to be used for installation is chosen, work towards the electrical details. Check the power source and make sure you match it with the outlet. Make sure the voltage required for the AC unit is available at home. Through-wall ACs use standard 110-120-volt plugs, but some larger or older units may also use 220 volts. If your house does not support the voltage, consult an electrician to install special electrical wiring. Be sure the power cord that comes with the unit is long enough. It’s never a good idea to use extension cords or splice cords to make it longer. Choosing a Through-the-wall AC unit requires you to focus on several parameters apart from the price and cooling ability. Get yourself equipped with the following information before you purchase an AC. Room size - The cooling capacity is calculated based on BTUs (British Thermal Units) of the AC. If the unit produces higher BTUs, it can cool a larger room. Of course, how the room is used makes a difference, too - you’ll need a more powerful unit for a kitchen than a bedroom, even if they’re both the same size. This table will help you determine the BTUs you need based on the square footage of your room. Square footage is the length times the width of your room. Wall Measurement - Pick the wall and its measurements to correspond to the size of the AC unit. You need to leave enough space around the installation area to allow good ventilation on the exterior side of the wall. It is also important to note the thickness of the wall. Sunlight - If the room gets more natural sunlight, then you need to consider an AC with higher BTUs. This will allow better cooling around the space. Ceiling Height - For rooms with a ceiling height more than 8 feet tall, you will need a more powerful unit. Voltage - Mos newer models require 115 volts, but some larger and older ones require 208/230. An HVAC professional or electrician may be able to add the kind of plug and line you need. Heat and Other Alternative Modes - Through-the-wall AC units can sometimes provide additional features. The most popular one is the heat mode. Unlike a heater that uses electric heating, these AC units use a heat pump to warm the room during the Winter. Wall sleeve - While installing a through-the-wall AC, you also need to pay attention to the type of wall sleeve that goes with it. A wall sleeve is a metal stand that is installed to hold the outside portion of the air conditioner.There are two types of sleeves - the slide-out chassis and the through-the-wall sleeve. Slide-out chassis sleeves allow venting from the back and the sides of the unit. They can be used both with both through-the-wall and window units. Often, they are first used with a window unit that’s replaced by a through-the-wall unit. A through-the-wall sleeve is usually the better option for through-the-wall AC units. These vent out through the rear side only and work best for thicker walls, even beyond 8 inches. Sleeves are normally sold separately from the unit. So if you’re going out to buy a sleeve, make sure you know the brand and unit dimensions of your AC! Keep reading below to find more in depth reviews of each model. To make your purchase decision simple, we have brought together a list of TTW AC units from different brands. Note that each one comes with a different cooling capacity. If you elect to make your purchase of any of these products through Amazon, you can opt for installation for an additional fee right from the product page. 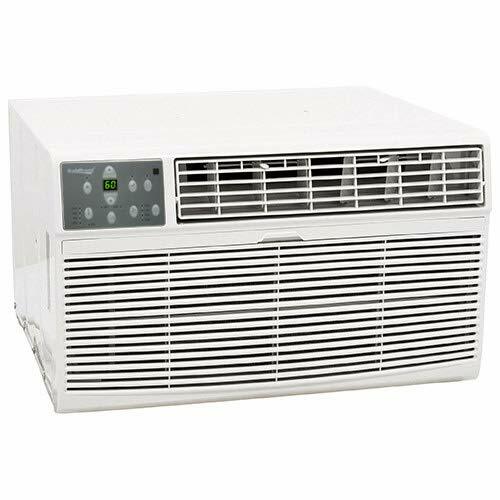 The Koldfront WTC12001W 12,000 BTU 208-230V Through-the-Wall Heat/Cool Air Conditioner is an excellent through-the-wall air conditioner that you will never regret investing in. It is simple and easy to install – users report that the whole process, including taking out the wall, will take under fifteen minutes, which is pretty dang great. This unit boasts some versatility, as in addition to the cooling function, it also has a heating function and a dehumidifying function. Its air vents point in four different directions for maximum cooling/heating/dehumidifying capability. It can cool down rooms effectively even in rooms with vaulted ceilings, which is quite impressive. Really, there is not much you are not getting when you choose this unit. The Koldfront WTC12001W 12,000 BTU 208/230V Through-the-Wall Heat/Cool Air Conditioner is a fantastic unit with a wide range of versatility and a simple installation process that simply can’t be beaten. It does have some inconvenient aspects, such as low energy efficiency, that you should take into consideration, though. 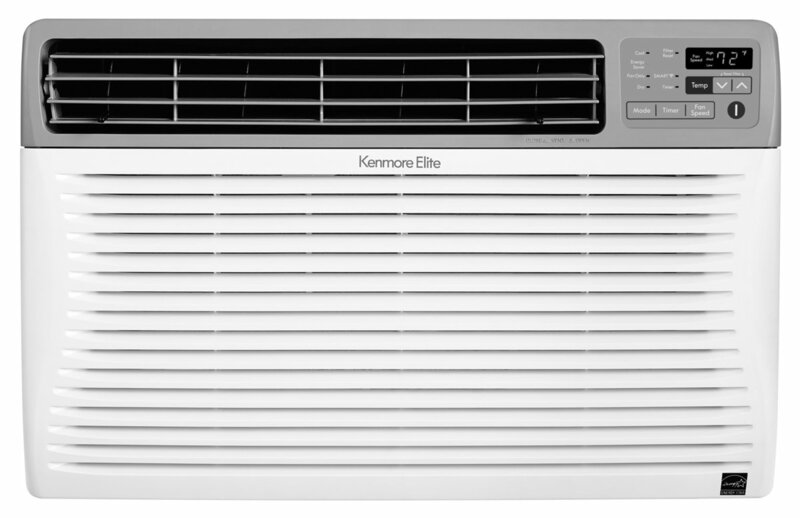 The Kenmore Smart 04277127 Room Air Conditioner is the through-the-wall air conditioner of the future – that is right, everyone, here is an air conditioner with WiFi capability at last! You can download the Kenmore Smart AC app to your smartphone or smart device (including tablets, and the app is compatible with both iPhone and Android smartphone models). If you do not have a smartphone or are not technologically inclined, you can also control this unit using a remote control. It has four different modes: fan, cool, dry, and eco. Eco will save you substantial money on energy costs. But beyond all of the bells and whistles on this unit, it is also just a straight up awesome through-the-wall AC. It has adjustable “fins” which will help direct airflow to exactly where you need cool air the most. It is simple and easy to operate, WiFi or no. It is quiet, even when turning on or powering down. If you invest in a Kenmore Smart 04277127 Room Air Conditioner, you will be one happy (and cool!) camper. The Kenmore Smart 04277127 Room Air Conditioner is a great unit with the newest and coolest technological features. It is a little confusing to read through the instructions, though. 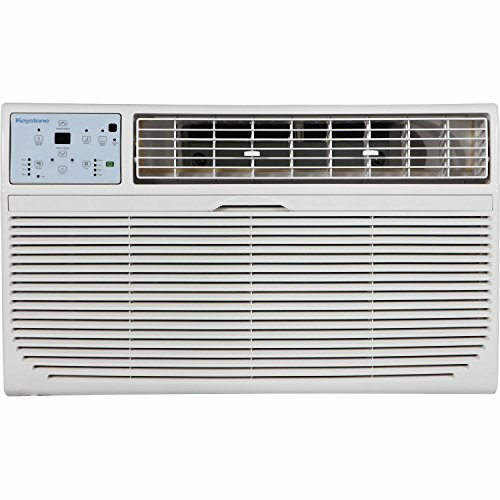 The Frigidaire FFRH1822R2 18500 BTU 230V Median Slide-Out Chassis Air Conditioner is an awesome through-the-wall unit with a wide variety of different functionalities. It is also able to heat and dehumidify a space in addition to cooling it, and it has three each of different cool speeds, fan speeds, and heating speeds, for a total of nine main options. Its different modes include auto mode, in which the fan is able to adjust to the room temperature, and a sleep mode, which slowly increases the temperature after the unit is turned on, which is ideal for falling asleep at night. It can blow cool or warm air in eight different directions thanks to its comfort control design. And, if you are ever in a situation where you no longer want a through-the-wall unit and instead desire a window unit (such as if you move to a new home where through-the-wall is not an option), this unit also comes with a window mounting kit, so you can really put it wherever would work best for you. 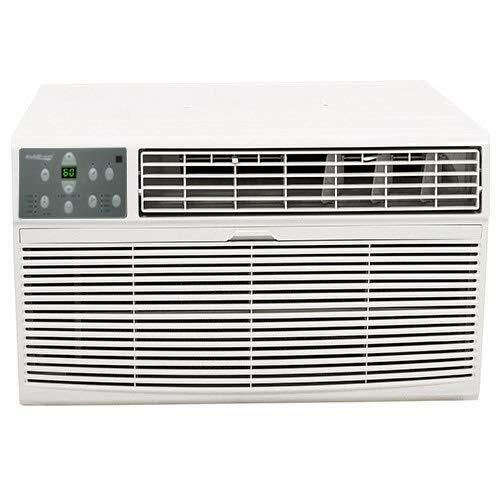 The Frigidaire FFRH1822R2 18500 BTU 230V Median Slide-Out Chassis Air Conditioner is a fantastic unit that will provide you with a lot of versatility to meet a wide variety of your needs. Just know that if something goes wrong with your unit, Frigidaire is not the greatest at providing solid customer support. It also has a dry mode to avoid humidity buildup. This is a quiet machine with a great cooling capacity. It fits the wall sleeve used for other similar product brands. The water gets drained from the rear side, keep it out of the way. It can rattle and get noisy if installation is not done well. The LG LT1016CER has a 2016 Energy Star rating of 10.6. Its 9800 BTUs cools a room of approximately 450 sq ft, all things being equal. 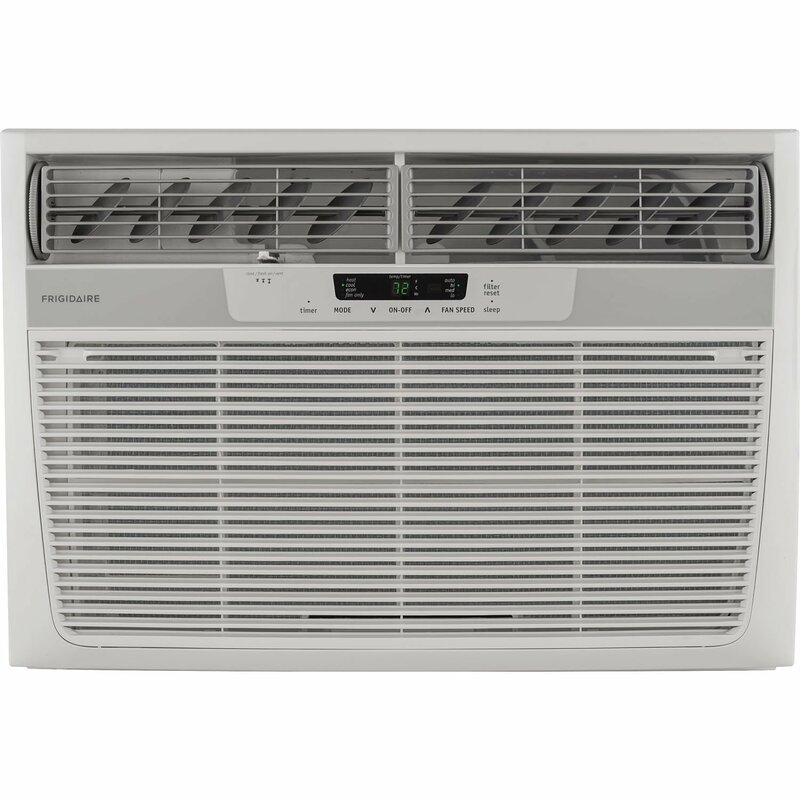 You can enjoy cooling flexibility since this AC comes with 3 cooling speeds and 3 fan speeds. It also has an easy-clean mesh filter with a “clean filter” alert. The unit has LG’s patented gold fin anti-corrosion coating that provides a protective shield, helping preserve your unit for a long time. It is designed to fit into the 26-inch wall sleeve. The sensor controls and remote control are some of the most popular features. It is also a long lasting product. With low ceilings and limited sunlight, this unit can cool larger rooms than the product promises. It is another quiet and very energy efficient AC that can keep your electricity bills low. There are some complaints about the quality of customer service and responsiveness on warranty claims. Its cooling capacity and value for the money are big pluses. Its money-saving features include an energy saver mode, sleep mode and a programmable 24-hour timer. This may not be the quiet machine you are looking for. It canget noisy over time. This is another through-the-wall AC that has very similar features to LG LT1016CER mentioned above, but carries 12,000 BTUs and can cool a room of about 550 sq ft. This machine is suitable for both Summer and Winter, as it includes a 4200 BTU with a heat pump of 4200 BTUs. 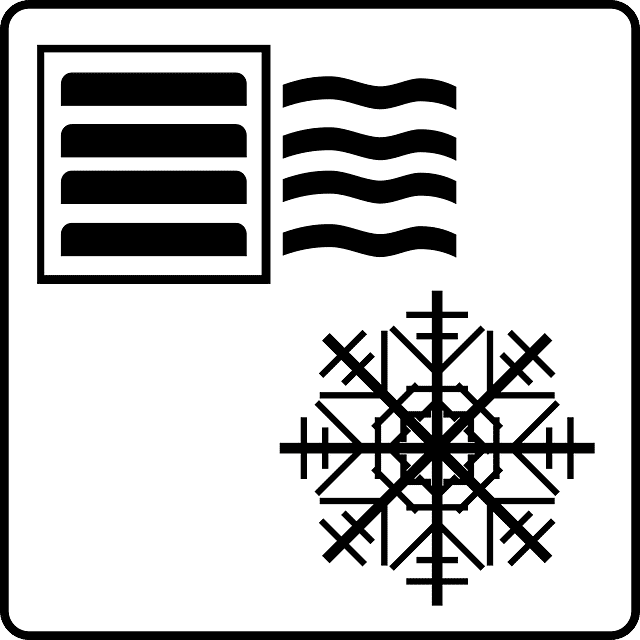 However, just a word of caution: the heater is only a supplement to the existing heater and does not substitute a heater by itself. That’s not going to be enough power to completely take care of your room. You might be turned off by the instruction manual. There are also mixed reviews about ease to install the machine. This 8000 BTU AC unit cools an area of 300 - 350 square feet It comes with a remote control and two-year warranty. It has 4-way air directional louvers, three fan speeds and four operation modes. Sleep and energy-saver modes are also among its features. A digital thermostat controls heating and cooling. 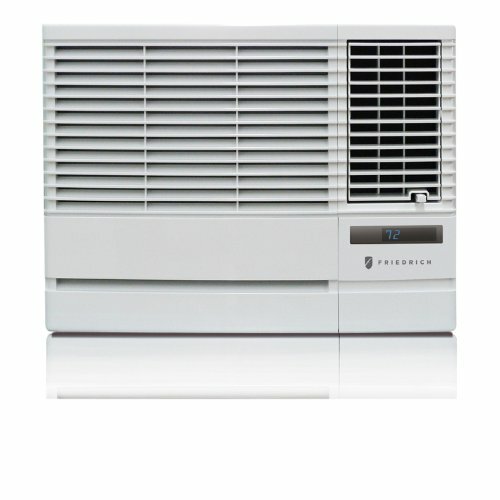 The Friedrich machine has many money-saver features like auto air sweep for more cooling as well as fan cooling. Unlike most units, it comes with a through-wall sleeve for installation. The power cord can be pulled out from both sides of the unit. It can be a little noisy. 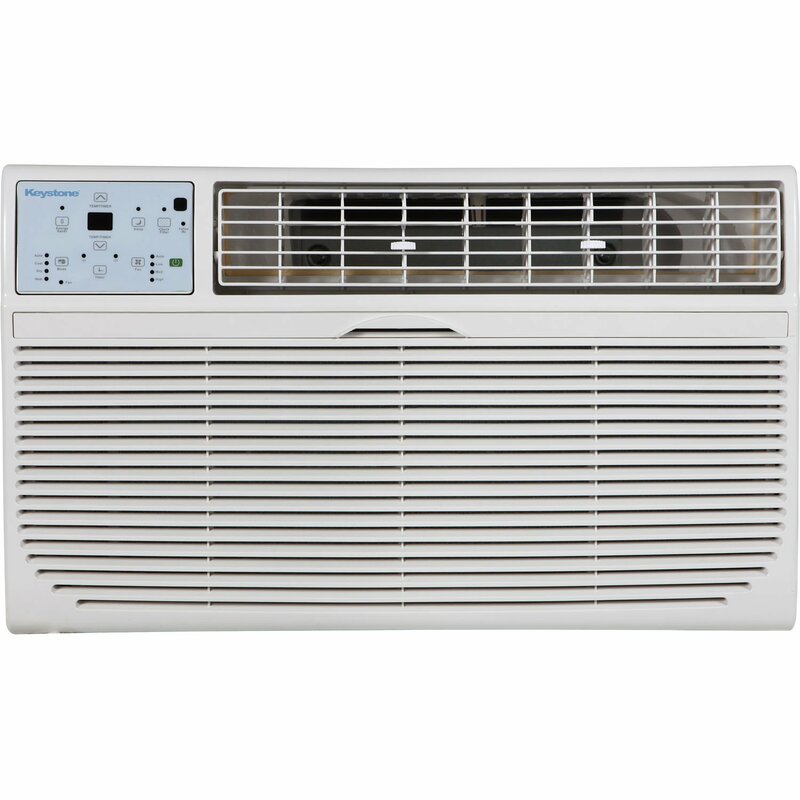 This is a highly recommended through-the-wall AC brand and performs well compared to other 8000 BTUs units - and at a reasonable price. It should comfortably cool a 350 square-foot room with a wall thickness of 7.5 inches. Some of its winning features include washable antimicrobial filters, “Entrygard” anti-intrusion protection and expandable side curtains. It also has a pretty aesthetic design for something that’s more functional than decorative. As is standard with most units, it has other basic features like a remote control and three fan speeds. This can be used as a window or through-the-wall unit. Through-the-wall air conditioning units are most popular among those who want to save up the window space and keep this as a permanent cooling system. However, keep in mind that this involves installation and requires professionals to work on it. On the whole, this would be great value for money considering the energy efficiency that you will enjoy.